You've likely heard that breakfast is the most important meal of the day. And it's true. Numerous medical studies over the years support this. Choosing the right foods to refuel your body when you wake up improves your memory and allows you to focus. Skipping breakfast may make it more difficult to concentrate. And if you think that forgoing a morning meal will prevent weight gain, think again. Eating first thing not only improves your concentration and ability to remember, but it also helps control the number on the scale. When you skip breakfast, your body goes into fasting mode, which increases your insulin response and, in turn, causes your body to store more fat. The calories you take in at breakfast help fuel your brain, which elevates short-term memory. However, eating too many calories in the morning could hinder your ability to concentrate, reports the "Journal of Adolescent Health." A heavy meal could leave you feeling drowsy and sluggish, making it more difficult to concentrate and remember important things, and a meal that is too light won't provide your brain with adequate calories to function. Try to get between 350 and 500 calories from your breakfast for the most benefit when trying to improve retention and sharpen focus. When you are choosing a morning meal, try to include a mix of complex carbohydrates, protein and fat. This mix of nutrients increases memory and allows your body to get the fuel it needs to focus. Carbohydrates are an especially important inclusion in your morning meal because they have the most impact on long-term memory. 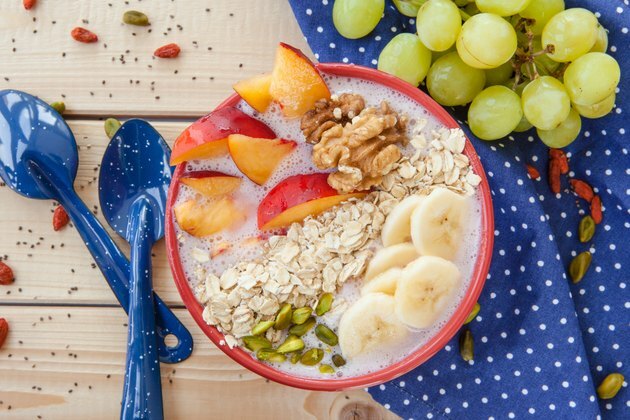 A study conducted by the University of Toronto and published in the December 2000 edition of the American Journal of Clinical Nutrition found that eating a carbohydrate-rich breakfast increased performance on short- and long-term memory tests among participants. Many people skip breakfast because they don't feel well when they eat right away or because they don't want to gain weight. However, eating in the morning will increase your performance at work or school. Try to eat within an hour or two after you wake up so that your brain is able to function optimally. If eating a large amount makes you uncomfortable, try eating a small snack soon after getting up and then another one an hour or so later. Fruits and vegetables are good sources of carbohydrates and are a vital part of a healthy breakfast for improved memory and concentration. Try slicing fruit over whole-grain cereal or adding chopped vegetables to an omelet. Eat a whole-grain bagel with low-fat cream cheese and a cup of berries or topped with sliced tomatoes and cucumbers. Prepare oatmeal with low-fat milk and top with dried cranberries and sliced almonds. Have a slice of whole-wheat toast topped with peanut butter and a sliced banana or low-fat yogurt topped with granola and fruit. These meals are low in calories, high in nutrients and offer the right mix of carbohydrates, protein and fat that your brain needs to focus and remember.